Destiny 2 - What is the Iron Banner Season 1 Reward? The Destiny 2 Iron Banner Season 1 reward is going to disappoint you. Destiny 2 is all about the loot. Well, it’s supposed to be all about the loot. You play the various modes and activities in the search for that epic gear. Shaders to make you look good while you’re killing Calus, swords to terrify your enemies in the Crucible, and ships to make your fellow Guardians jealous before you load into the Leviathan Raid. With this week’s Iron Banner, players were expecting something awesome from the Season 1 reward. Players are about to be let down. In the original Destiny, the Iron Banner was about testing your Light against other Guardians in the Crucible. It was about increasing your Light and completing that awesome looking set of Iron Banner Armor. Many Guardians were expecting a similar experience in Destiny 2, but so far that seems to be missing. Most Guardians are reporting very low Armor drops from their Iron Engrams that Lord Saladin gives out. This was worrisome, but at least they had the Season 1 reward to look forward to for collecting 10 Iron Banner packages. The problem is, the Season 1 reward is an Emblem. Not an Exotic drop or an exclusive item that’s useful, but an Emblem that you can equip. Considering you’re likely to get Iron Banner Weapons from the Iron Engrams you earn in the Iron Banner, this seems like a weak Season 1 reward. 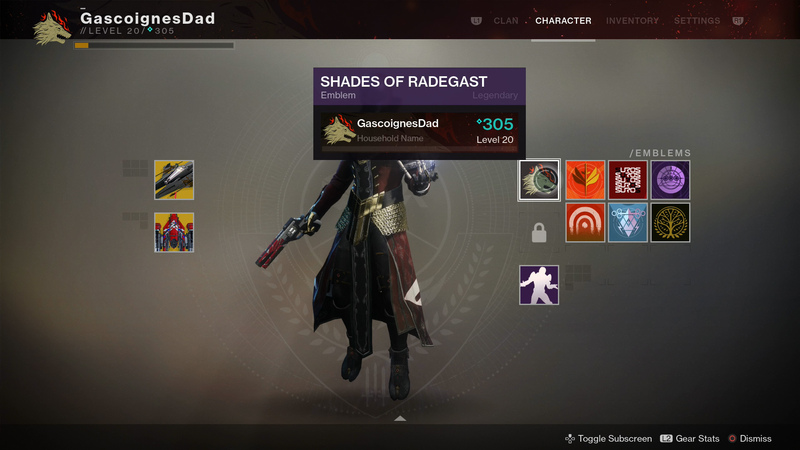 The Emblem that you’ll get is the Legendary Shades of Radegast. To the best of my knowledge, it does nothing special for you except tell everyone on the roster that you got suckered into completing way more Iron Banner than you should have given the rewards. In fact, the Emblem shouldn’t factor into your time in the Iron Banner at all. If you’re there for any reason, it should be to collect the Iron Banner Weapons and Armor, but even that is questionable. When you’re ready to take a break from the Iron Banner, visit our Destiny 2 complete strategy guide to help you get some worthwhile rewards.